App Builder Appy Pie: Remember the times when you would go to the yellow pages when you wanted to find a business, you don’t? Well, frankly I don’t either. But you do remember going to the websites, right? Not so long ago, most of the consumers would look for information on websites, and since the smartphone gained their immense popularity, everyone was using them for every search and the mobile friendly websites took the throne. While this phase lasted for a long time, but in the recent studies it has been established that out of the total time spent on their smartphones, consumers are dedicating the most of it on a variety of apps that they have installed on their phones. In this blogpost, we are going to talk about why your business needs a mobile app, how to build a mobile app for business, the types of app creators, app features you must include, benefits of using a DIY app building platform, things to know before choosing an app building platform, what you should look for in an app building platform, questions to ask before choosing the app building platform, and a list of the top app building platforms today! 3. How to build a mobile app for business? 6. How do DIY App Building Platforms work? 8.1. What kind of app do you need – native, hybrid, or web? 8.2. What is your budget to build your app? 8.3. Would you need support for graphic design? 8.4. What kind of plug-ins, add-ons, and integrations do you need? 8.5. How do you plan to import & manage your content? 8.6. Have you established back-end infrastructure already? 8.7. Would you need support with analytics, promotions, & marketing of your app? 9. 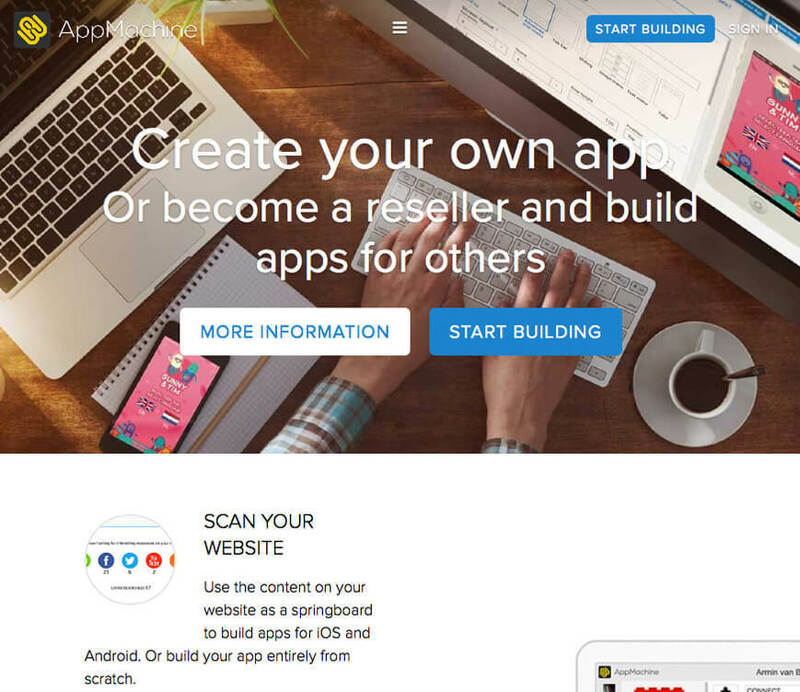 What should you look for in an app builder? 10. What questions should you ask while choosing mobile app development platforms? 10.1. Can I see some examples of the apps you have developed? 10.2. What is the size of the companies that you have built your apps for? 10.3. Who are/were your clients? May we interact with them? 10.4. Do you understand the market I am targeting? 10.5. Do you have any experience in building the specific features that I need for my app? 10.6. How much do you focus on design & user experience? 10.7. How are you going to help me monetize my app? 10.8. What would be the mode of communication during the development process? 10.9. Would you be testing my app? How? 10.10. Would it be you who would submit my app on the app stores? Under whose name would my app be? 10.11. Would you offer maintenance for my app? 10.12. Who would own the mobile app? 10.13. What are the charges and what are your payment terms? If you look a little closer at your everyday interactions, you might discover that some of the small businesses, from the local mom & pop retail store, to your favorite spa or salon have their own dedicated apps. These businesses stand to gain a higher ranking and garner the early mover’s advantage especially when it comes to taking their marketing game to a higher level. However, if you are one of those businesses who are still on the fence about going ahead and building your own app, then do go through the reasons listed here-under that might just convince you to get one now! Inherently, the mobile apps can help you bring together a number of marketing tactics and make them work cohesively and efficiently for your benefit. For example, one of the most effective marketing tools to work in the American market is the loyalty program. For a small business owner, it might be a cumbersome process by itself, however, with a mobile app for their business in place, it is extremely convenient to identify the loyal customers and reward them. This may be something as basic as letting your app keep a track of the qualifying purchases towards a reward instead of making use of an old-fashioned punch or swipe card. Another way to do it is by incorporating geo-location capabilities which may be used to text special offers to the members of your loyalty club when they are in the proximity of your store or a place of business. Apart from this, app is a great way to communicate with your customers at any time, irrespective of their location. You can make use of this feature by letting them know about an upcoming sale or event, book a table, confirm the bookings, and even send out a push notification. Push notifications are a great way to engage with the clients as studies show that 60% of the push notifications are opened by the mobile phone users and 40% engage with the app as soon as they receive the notification. If nothing else, then this ought to get your attention. Your customers have already been buying your product or services from your website, so when you incorporate this option in your app, through in-app purchases, you are offering them an opportunity to shop even on the go! This means they do not have to switch on their laptops or desktop computers in order to buy something from you. You can include a product catalog and incorporate ordering or booking capabilities in your app and add a channel to garner great revenues! If you do not believe us, ask the Domino’s guys! In just the first six months following the release of their app, they saw a 28% increase in their online sales in the UK alone. Today, more than half of the company’s online orders come from mobile devices. This example demonstrates that if you make the ordering or buying experience easier, customers are going to buy more! Did you know that the global app revenue is expected to reach 188.9 billion US dollars by the year 2020! This means there is a huge amount of purchasing power involved here. You can not only benefit by garnering sponsorship or go for putting in advertisements within your app. If your business is not about making and selling apps, you probably do not have the expertise to build your app in-house. However, there are a great number of individuals or agencies or companies even, who are in the business of creating apps and would do it for you. There was a time, quite far back in the past when the prices quoted by these entities would deter you from getting a mobile app for your business. There was a time when custom building your native mobile app was the only way to go, and they cost somewhere in the neighborhood of a $100,00! However, the technological field especially pertaining to mobiles is ever evolving and offering innovative solutions every day. Hence app building too is getting quicker, easier, and a lot better. Today, companies like Appy Pie are emerging as great partners for small businesses and making it possible for them to own their mobile apps for business. These drag and drop apps look great, are loaded with features, offer a native app experience, and do all that at an affordable price! Everyone is getting one! Yes, there is a very visible movement towards building mobile apps for business and for good reason. The small businesses in particular are getting convinced about building their own apps and if you are not, then you stand to lose out by being left behind. And you do not want that! About 50% of the small businesses already have their apps built and a good number of other players are on their way to get their apps made. The trend of getting a mobile app for business, is a trend for a reason, and it does look like it is going to stay. The businesses who have built their mobile apps are not only increasing their revenues but are also enhancing their customer service by staying connected to their consumers. Mobile apps are used in quite a different way, as compared to any other medium, which means that it effectively opens up business dimensions and opportunities that were as yet unexplored and sometimes even unheard of. One of the most significant of these aspects is the scope of being able to leverage technology and work to resolve and queries, concerns or issues raised by the customers and satisfying the needs and expectations of the customers from the business. This aspect paves the path for innovation, thus encouraging businesses to come up with new products and services. No matter what your business, you must stay up to date with the latest technology, not just internally, but also externally. If you want to stay in the business, you need to be relevant, and having a mobile app for your business may help you do just that. For example, the current trend of virtual reality might help your app offer to your users an exemplary virtual shopping experience! You might even do it before your competitors and bring in more customers than you thought possible! Having a mobile for your business is rapidly catching up as a trend, and you must jump on the bandwagon before it is too late. It not only makes you a part of what is relevant today, but also helps you stand apart from the rest. When you have a mobile app for your business, and specifically build one that performs better and has features that make it easy to use for the customers, you not only bring in more revenue but also benefit by developing your brand image as one of an industry leader. Irrespective of the industry you belong to, the respect for innovation is always high. A mobile app can also be used as a great tool for brand building and spreading awareness about the brand among the targeted audience especially. Your mobile app can be a blank canvas for you to paint it the way you like and build the desired brand image. You can go hip, stylish, classic, nerdy, or fashionable and justify your brand with your app. Your app can have all the required features that the customers are looking for, and your brand can develop a strong image with a good design incorporated in it. The leading app stores including Google Play, Apple’s App Store etc. receive millions of hits on a daily basis. On these app stores, if you manage to optimize your app in the correct manner, you are bound to increase the number of downloads or installs. However, that is not all that you stand to gain from it. When done right, app store optimization can get great visibility for your app and can help you route aptly targeted and relevant traffic to your website while garnering valuable backlinks from pages that have high authority & credibility. App Store Optimization has a great deal of science behind it, and a substantial bit of intuitive thinking as well. It involves selecting the right keywords and then placing them at just the right frequency to pave the path for a greater visibility and enhances exposure for your business. If you build your mobile app and then leave it entirely to fend for itself, you are not really doing yourself any favor. If you want to boost your website traffic using the app store, you would have to commit time and resources into it. Through app analytics you stand to get a great amount of data and this is one of the most important benefits in order to understand your targeted consumer. The data received this way can be processed into meaningful and valuable insights. These insights can then help you invest in an informed manner and increase your ROI. A poll conducted recently revealed that 87% of the organizations or business entities agreed that analytics help them make the existing services and products a lot more profitable. These app analytics can also help you pull in data and help you identify the most profitable and promising regions, demographic segments, customer needs and the overall performance of the app. Apart from providing insights about product enhancements, this data can also help you identify new business opportunities that’d help you develop new products and features to meet the needs of the customers you are targeting. A mobile app is structured specifically in a manner that would help the users perform the common, desired functions without having to wade through the messiness of a website. The mobile apps are a lot more intuitive than a website (even the ones that are mobile friendly) and lets the user know what they are supposed to do with the app on their own. Additionally, the apps offer a lot more personalized experience as compared to a website which might need you to login every time. Actions like saving shopping lists, marking favorites, personalized rewards and offers, or easy navigation. When you offer a better user experience you stand to gain a great number of positive reviews, an increase in the number of followers on social media, a greater number of loyal customers, and most importantly repeat customers! The leading app stores, Google Play and Apple App Store have a minimum speed requirement for your app to be approved by them. This means that your consumers or app users would receive a faster and smoother experience encouraging them to interact more and stay engaged for longer with the app. One of the key points here is to frequently and creatively think up ways to test your app and tweak it in order to provide a flawless experience to the user and convert them too. The world is on the move all the time, every day. If your customer is always on the move, and all you have to cater to their needs is a website or a physical store, you are not really going to make the cut! When you have a mobile app for your business, you are effectively making a space for yourself and your business on the users’ screens. No matter where your user goes, they have their smartphones on them. And when they have your app on their phones, you are travelling with them too! The number of smartphone users is going to reach 2.87 billion by the year 2020 and by 2019 the number of mobile phone users is going to reach 5 billion! It has been established through research that the smartphone users spend most of their “phone time” on the apps they have installed on their phones. Your app could be one of them, and you could be the one gaining business through a mobile app! When you have a mobile app, you have the ability to deliver your products and services in a much more effective and timely manner. You can use the mobile app to showcase and promote the most valuable aspects or the USP of your product or services while enhancing their efficacy with customized choices and features. Whether it is an online loyalty program, or offering updates about sales and discounts, or offering step by step directions to your place of business, an app can offer great value to your customers, converting them with greater efficiency and engaging them for longer times, making them come back for more. The modern age consumer is attached to their smartphone, in fact, they are hooked! A whopping 87% of the smartphone users begin their day by looking at their smartphones. The smartphones have become an extension of the modern consumer. An average American spends a total of 10 hours or more looking through screens and of this a greater chunk is spent on the apps they have installed on their phones. It is evident, therefore that the level of engagement attained by a mobile app is a lot higher than the normal websites. Hence, when you get a well-designed app loaded with the right kind of features that functions smoothly, you have the potential to engage your users for longer and in a more effective manner than simply having a website or no online presence at all. Once you are convinced that your small business is ready to reap the benefits of having a mobile app, it is time to get started! However, since you are probably not someone who is in the business of making apps, you might not have all the expertise needed to build your own app. At this point you might consider building your own app either by hiring an individual or an agency to do it for you. No matter which way you go, it is important that you understand the process of building an app for your business. Anything that is unfamiliar is bound to cause some trepidation, no matter who you are, you are going to feel a little overwhelmed when you are getting into unchartered territories and guess what? It is totally normal to feel that way! However, we at Appy Pie understand this fear and trepidation, having dealt with hundreds of thousands of clients who come to us to build their mobile apps with little to no knowledge of the process. Here is a step-by-step guide that will help you understand the process that you would need to follow in order to build an app that is set on a path to achieve success. This is something that will decide every little detail of your app and what it is going to be like. Even before you start doing anything else, it is important that you know quite clearly, what it is that you are selling, what your company is about, and the look and feel of your app including elements like the colors of your logo, the fonts and other such important details that go into your app. Apart from this, you must also figure out what kind of content you are going to put in. in case you already have a blog, or a YouTube channel or any other channel, you can also integrate your app with it or convert your website into an app. This is a great way to go ahead when you have a lot of existing content in your kitty already. Do you have an app idea? If the answer to this question is a resounding yes, you should move on to the next step. However, if you are still looking for a great idea for an app, let’s dig deep into this one. It is quite common for us to meet people who know that they want to build an app, but are at a loss when it comes to the idea for an app. One of the best ways to get started here is by looking at the problems around you. There are problems all around us, they surround us, all we need to do is take a deeper look at them. Some of the most successful entrepreneurs have only garnered success by coming up with solutions to the problems around us in a way that is unimaginable to most. In fact, if you choose to take a look at all these products and services around you, you would realize that each one of them exists to solve a problem. You wanted to talk to someone who is in another city, you got telephones, you wanted to talk to them even when you or they were on the move you got mobile phones! You get the idea, right? Now look for problems in your daily life, list each of them down. After building up an exhaustive list of these problems, you can now start working out the ways in which you can solve these problems. Once that is done, you sit down and shortlist only those ideas, problems & solutions that make any sense at all. The problems you face might be quite different from the problems I face, after all isn’t every individual different? Hence the problems you are considering solving might actually not be a problem many people face. For example, you might be bothered by the issue of not knowing exactly how many steps your car is from your study room chair and come up with an app to take care of that problem. But if no one else (or not enough people) are worried about it, you are going to build an app that no one wants! When you get your idea validated, you prove that there actually is a need for the solution you are offering and that a demand for your app exists. One great way to do this is by making use of Google Keyword Planner tool in order to get a fair idea about the number of people who are looking for something that you are planning to build. One more way to do this is by creating a landing page and let it showcase some of the most basic highlights about your app and urge the visitors to signup through their email in order to express interest. Go back to the basics here and take out your pen and paper. Define what you want to achieve, in as clear a manner as possible. this comes before any form of coding, programming, designing, or anything else. We have a list of questions that, at this point you must ask and then answer. What is it that you want your app to do? What are you going to do, to make it appealing to your targeted users? Which problems are you going to be solving through this app? In what ways would your app simplify people’s lives? What are your plans for marketing your app? Like any other business or projects, this too must begin with a clear set of objectives. If you fail to do this, you would be suffering from a lack of vision, which in turn is not only going to cause you frustration, but also any other employee or vendors you might hire. Make sure that you develop a clear picture of what it is that you want to do. In this age of mobile devices, especially smartphones, it is the mobile apps that would achieve the most interaction. New age customers would interact with their brands, mostly through their apps. However, for that to happen with you and your app, you would have to figure out what it is that the target user group wants from your app, or your brand. Not only is the user experience with a mobile app superior to the mobile friendly website, but it also extends more of a community feel to it. It is for this reason that mobile apps offer higher user engagement and afford you greater financial returns and opportunities. It has been established through sound research that brand loyals and users tend to spend more money in the apps when compared to the websites, and the chances of repeat customers is quite high too! However, this loyalty needs to be driven by you, the app owner, and this can be through any chosen measure including push notifications, visual content, personalized rewards for loyalty and more! You have come quite a bit of the way in your journey of building your business app, but it is still not the time for you to switch the computer on. Trust us, it’s not! Pick up the pen and paper and get down to sketch out the app, in terms of what the app should look like. You have your app idea clearly worded out for clarity, now it is time for you to convert these ideas and thought to a more visual form. Get into the brainstorming mode, decide whether you are going to charge people for downloads, going to include in-app purchases, or are going to give your app for free and include ads in order to earn money. It is important to sketch out all these ideas and put them down in a visual format. What is a wireframe? Well, to me it is kind of a glorified version of a storyboard. At this stage, you would take your sketch and your design idea and work on it to bring in a little more clarity and functionality. This step is of great importance as it is going to become the foundation for your app development. There are a number of wireframing website available online that you can use for this step. These websites can bring your sketches to life on the digital realm with varied functionality including click through and icons. It is important that you find the one that suits you the best. It is important that the sketches and your drawings are as detailed as possible. The sketches should also include the flow of how the users would be navigating through the app and all the features that you envision your app to have. When you do this step right, your app developer can understand your expectations with speed and accuracy. Now that you have your wireframe, you have a clear storyboard depicting the way you want your app to function. At this point you need to start making use of this storyboard and begin examining functionality. At this point, use your wireframe in order to delineate your servers, APIs, and data diagrams. These days you can even opt for some of the most convenient Do It Yourself app builders that have the right kind of tools to do this. Some of the app builders would even do it for you! In case you are unfamiliar with all the technical jargon and are limited in your knowledge of the subject, you can even go looking for a service that would provide you hosting and a means to collect all important data sets about the usage of your app. Irrespective of the method you choose to use while developing your app, it is of absolute importance that you create clear diagrams that can offer directions to the whole team working on the project. In case you run into a technical snag, you can make changes in your wireframe to sort it out. By this time, you have a whole document prepared that depicts the whole flow and features that your app is going to have. It is now time to begin looking closely at the features that you can do away with. At this time, it is advisable to offer only the core value of your app idea. In the first version of your app, it would be a mistake to add features that are merely “nice to have” but are not of absolute importance to the functioning of the app. These “nice to have” features can also be added later with an update. Doing this would not only help you keep the costs of the app down at the beginning, but also help you to release your app much faster and get to the market before you burn through all your money. There are quite a few small business owners who begin with the idea to focus only on the development phase and are only looking for a basic design. This can prove to be one of their biggest mistakes and lead to their app bombing in the marketplace. Design is a broad term, a very broad term which is a lot more than merely the looks of your app, it is also the way a user experiences your app. Design makes technology useful. It is therefore important that you find a developer who puts design including your user experience and graphics at the forefront while taking your project on. At this time go and find yourself a development company or individual developer who have a strong talent for design and an experienced development team. When you are looking to hire a designer/developer for your app, you must first go online and check on their credibility and the apps that they have created. Once you have gone through their work and find something that you like, chances are, you would be able to convey your vision to them and they would be able to deliver a product or an app that you would like. When you want to put your app in the market, i.e. on the different app store like Google Play or Apple App Store, you would have to create your developer accounts on these platforms to be able to sell your app there. For android apps that you want to sell on Google Play, you would have to pay a one-time fee of $25, for iOS apps that you want to sell on Apple App Store you would be charged an annual fee of $99. You can either register as an individual or as a company if you already have formed a company. So, you might have built an amazing app to be put on the market, but does it end there? You can’t just build an app and forget about it. You would have to understand which part of your app works well, and which part does not. What is it that people like about your app, and which aspects can be improved to make them fall in love with your app. When you incorporate or integrate analytics you can keep a track on the number of downloads, user engagement, and retention for your mobile app. You can choose from one of the many available free or paid tools like Flurry, Localytics & more. You have your app almost ready to be launched and have looked at deeply through different angles and perspectives. According to you, your app not only functions smoothly, is aesthetically amazing, but also solves a real-world problem devising a solution. It is time now to start testing how the app is going to perform in the real world in a live environment. Choose the right kind of beta testers and you would be able to get some valuable feedback about your app. This can tell you a lot about the direction you should take with the development of your app. You have done everything you could to build a great app and you are ready to launch your app and share it with the rest of the world. You might have gone on to solve a major problem, or at least have come up with some features that can simplify or bring some measure of joy in the lives of your app users. It is a BIG deal, time to distribute it now! The rules of launching and promoting your app on different platforms vary. There is a review process for both the platforms and you would have to wait for that period for it to be published on the stores. After you have launched your app and it is available on the app stores, you would have data from the customer usage and behavior patterns that would give you insights on how you can improve your app and enhance the features to make it a success. It is important to keep a constant vigil on the reviews and feedback that you receive from these users so that you can analyze it and improvise based on the feedback. Earlier, when you were building your app, you chose to remove all the flowery features. It was a good idea then, but now is the time to add some of these features to your app and make it more lucrative. It is time now to move on from the limited version with just the core features. The data you gathered and the feedback you received from the first version of the app can help you decide which features to go with, for making your app more suitable. One important thing to remember is that you can’t simply stop working on your app. You cannot just make it and leave it forgotten in the app store. You have to commit to it, and keep testing the app, and then plan updates that would make your app better and serve your customers to their satisfaction. With each new update, you have to make sure that you are offering more value to the users and making your app experience better. You can build your app in a number of different ways and choose from one of the many platforms for the same. There are no coding platforms that will help you make your app in minutes and then there are services for custom programming where you get to work with a dedicated developer on a one-to-one basis and build an app from scratch. There are a number of factors like the amount of money you can spend, or your concerns about getting the app accepted by app stores etc. that decide which platform would suit you best. 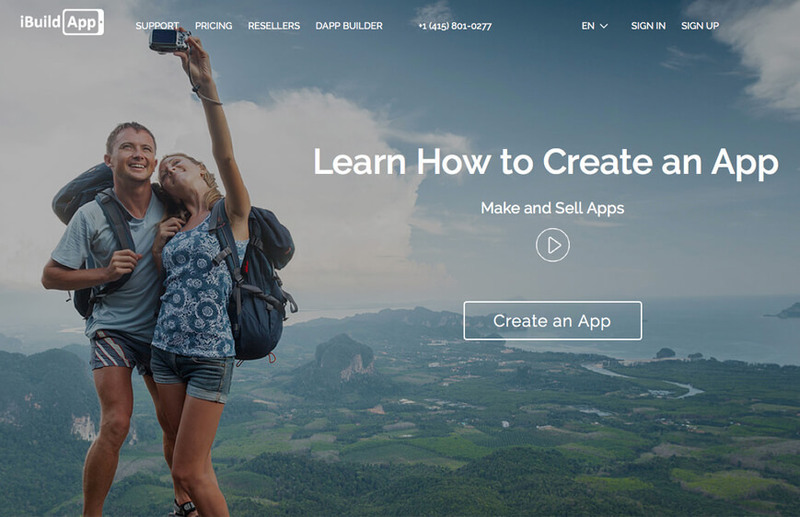 The DIY app building platforms are preferred by many businesses today simply because of the great ease of use that they offer with their drag and drop interface, and pocket friendly budget. No code platforms or DIY app building platforms let you build an app or design it for free and then charge you a publishing fee and a monthly or yearly subscription fee which varies according to the number of features that are included in it. Even on this platform there is a variety in terms of what you get, and of course the charges too vary accordingly. Some of the platforms offer you access to the app’s code for an option for hands-on development, include the cost of submitting the app to the store, and the automatic maintenance updates. Then there are some DIY app building platforms that also offer additional custom development service with in-house developers with additional prices. The biggest advantage of using a no code platform is that they are extremely user friendly and as no code app technology has been evolving in leaps in the recent times, there are multiple no code options that offer strong functionality to the app creators and the users. Making apps on DIY app building platforms is quick, and this is one of the reasons that it is so popular with the businesses that can not afford to wait for too long to get their app made. However, if you do not choose your DIY platform wisely, you run the risk of getting your app rejected by iTunes App Store. However, the more respected platforms like Appy Pie help their clients submit their apps for approval. Before you select your DIY app building platform, figure out which are the things that are included in the subscription. 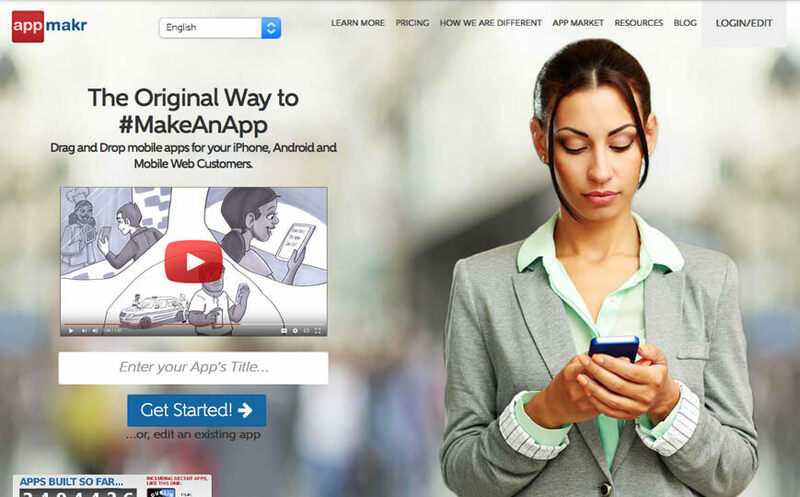 The custom app creators specialize in creating a mobile app for their clients from scratch. These companies in general have in house teams of designers and developers and dedicated project managers to help you build an app just as you like it. The biggest advantage here is that you have the liberty to build an app the way you want it and while doing so you get to be a part of the whole development process. The downside of this, however is that in custom building your app you would have to account for greater budgets and longer timelines. Since the price and the timelines may vary greatly according to what you want, you must look into the price quotes and have a clear idea about what you are paying for and the features that you are getting in the app. Some of the small and medium sized businesses decide to hire an individual developer either on a contract or full-time basis. When you hire an individual for the job, whether they are on a contract or on a full-time assignment you gain the ability to edit or tweak your app whenever you want and can even roll out the updates as and when needed. Hiring a developer, though can turn out to be quite expensive and unless you hire an entire team of designers and developers you are going to invest a whole lot of time doing that. As you delve deeper into the thought process of selecting the right kind of app developer or app builder platform for yourself, you must have a clear idea about the kind of features you would want in your app. Each app service would have its own areas of expertise and some specialized features that they’d offer you. Listed below are some of the app features that you must consider while finalizing your own list of features. In this era where everyone is squeamish about privacy and security concerns, it is especially the internal applications that critically need unique privacy & security options. In case you have any compliance issues specific to your business, it is important to discuss it right at the beginning. This is one feature that helps you, as an app owner stay connected with your users with great ease. You can easily let them know about the promotional events, sales, and new products or services with a single action. This is one feature most of the app services would provide. Loyalty programs are an established way to gain repeat customers and reward the customers who are loyal to your brand, products, and services. When you integrate a loyalty program feature into your app, it becomes easier for you to track the involvement of customers in the program and make it easier for the customers to avail the benefits of the loyalty program. This is not really a feature every app building platform offers, and if your business and the app you are building needs this feature then you must choose the platform carefully. Geotargeting lets you interact with your customers according to their location so that you can tailor your message to different segments. If yours is a business is spread out over different locations or you have customers in different regions, then Geotargeting is a feature of great value for you. This is a fairly common feature and lets you integrate the app with different social media channels like Instagram, Facebook and more so that make it easier for potential clients to find and download your app. Social Media integration helps you distribute marketing material to the existing client base. Though social media integration is also a kind of third party app integration, but many of the internal business apps might need additional integration of certain proprietary or business-focused apps. Hence if you are building an app for internal business use, leave scope for potential third-party app integration in future. Data and its analysis is the most important aspect for the evolution and success of any app. Most of the app creation services offer this feature as it helps you gain a peek into the behavior, expectations, and interactions of your customers within the app. In case this is important for your app and for your business, then you must include the right kind of reports in your subscription plan. This is especially important for internal employee applications. Get a clear idea about how the admin controls will be accessed and the options that will be built in. Ideally you should be able to control the permissions on the basis of groups & individuals. How much of customer service are you going to need? I am sure a lot! When you are trying to pick an app builder, you should not only consider the quality of customer service they are offering, but also the modes of communication. Appy Pie offers you 24X7 live chat and over the phone support in multiple languages. When it is about customer service, the more you get, the better it is. A majority of the DIY app builders offer to their customers an online platform that either claim to either be low code or no code. On a low code platform, the front end of the app which constitutes quite a big part of the app is built via a drag and drop interface to add features and utilities. This part of the process is quite visual and lets you design the app experience without anything really happening in the background. After completing the front end of the app, there still remains the programming part which a developer needs to take care of so that the app functions the way it is supposed to. This means that a lot of the developer’s time is saved, but there is still the need for a lot of technical knowhow which probably is why these platforms are almost exclusive to IT. No code platforms, however are a godsend for those business owners who need an app for their business but possess no coding knowledge or programming skills of any measure. These platforms offer app templates to their customers with an exhaustive menu of pre-built features, utilities etc. that suit the general requirements of the business. Here, the front end and the back end of the app are built simultaneously, but the customer doesn’t need to get into any technicalities at any point in the process. There are a number of features like uploading images, videos, text content, lists, documents, directories, and so much more that are offered by these platforms. Upon completion of the design & development, and testing, the app you built on a DIY platform can be distributed through any of the app stores you choose, or even internally through an enterprise app store. Now that you have a fair amount of understanding about making apps and choosing a suitable app builder for yourself, it is time you were exposed to the insurmountable benefits that you stand to receive when you build an app on a DIY app building platform like Appy Pie. When you are building an app for your business, you are essentially introducing new technology to your business. There, of course, is a cost attached to this introduction. With a DIY app building platform, this cost is a lot lesser. You can purchase monthly or yearly subscriptions at a pretty low cost and build your own app for business. While some of the better agencies may charge you somewhere between $100,000 to $500,000 for a custom app made from scratch, the subscription plans for Appy Pie start from as low as $15 per month. The difference is too high to ignore! The no code platforms take considerably less time, sometimes only minutes to be built once you have designed it the way you want. All you have to do is drag and drop all the features that you want in your app, add the required pages, text, images, video, or any other component that you need. Once you have done that, you would have your app ready to be launched within a few minutes! This is a huge advantage when compared to the months that it may take to make an app from scratch. As the platform has a reusable code, it eases app development and its deployment considerably. It is this usability that allows the businesses to scale or change their product with great ease at any stage. Apart from this, when a business is using a platform-based app, the risks are lower simply because they have the option to change their apps easily with minimal costs. In case of custom apps, there are restrictions regarding iterations, which can be a potential problem for you when you want to adapt to the latest trends and evolution of technology. As a business owner who is building their app, you might not have the technical knowledge needed to keep your app performing at its best. When you avail the services of an app development platform, professional technical support from their team is built into the subscription. When your technical support is outsourced, your in-house cost is considerably reduced. If your brand-new app looks great today, and is up to date with the latest requirements, functioning smoothly, it does not mean that it is going to stay that way without any maintenance whatsoever. When you go for a platform-based app, you have the maintenance of the app and updates worked into the cost of the subscription. This means that the on-going maintenance woes are also taken care of and the risk of your user trying to open an app and finding out that it is not compatible with the updated software on his phone are less. In a custom app, incorporating each feature would ride your costs up and it is essentially an a la carte system where you pick and choose exactly what you need and there are chances that the final figure would be a wild amount away from the initial estimate. On a DIY platform a plethora of features are built in and all you need to do is drag and drop them, without any additional costs, what’s more you can edit them any time you want! Whether your target consumer is an android user or an Apple loyalist, you would want to cater to them both. If you go the custom app way, you would have to (at the start decide which app store you are building your app for – Apple or Android, or both! Choosing both in this scenario is going to double your costs and the time involved. On Appy Pie all it takes is one more click, and your app would be ready to go on both the platforms for a marginal added cost! When you build an app with a DIY app building platform like Appy Pie you get a unique dashboard feature which gives you a great amount of control when it comes to handling multiple apps that you have developed on the platform. The dashboard is designed to let you make changes whenever needed with great ease and speed. The dashboard offers you control, and information about all your apps in one consolidated form so that you have an overview whenever you need it. This is not something you would receive if you had multiple custom apps, especially if there were more than one agencies or entities involved. Once you have chosen to go the app way, you have to go looking for an app development platform. However, before you can get down to asking questions, you must have certain answers ready before approaching an agency or an app builder platform, or even an individual developer. Listed below is a list of questions that you should have answers for, even before you go looking for an app builder for your app. The app builder platforms today offer you a world of options and opportunities to build an exceptional app, irrespective of your line of business. App builders today cater to every business under the Sun, from e-commerce, to event management, restaurant to wedding planning and so many more such businesses. Some of the platforms would even offer you a choice between native apps, hybrid apps, or mobile web apps. This is something you would need to be prepared with an answer for. Do you want to focus on the fabulous user experience provided by a native app, cross-platform flexibility afforded by a hybrid app, or would like to have a mobile web app. The first kind of app that pops in our minds are the native apps that are hard coded to function on a single platform whether it is Android, iOS, Windows, or any other. Here, the app is installed on the device and does not need any configuration or a browser to function. These apps have superior user experience with features like push notifications etc. while gaining access to all the native hardware on the device like Camera, Microphone, GPS etc. A mobile web app is essentially a responsive, mobile version of your website that runs on the device via the browser. The fun thing here is that you do not need any knowledge of platform specific tools or languages is needed to build a mobile web app, and they would run flawlessly on any device. The catch here is though that app would not have access to the device hardware. Everyone has a budget, and there is something always to fit every budget. Pricing plans for app building platforms vary quite a bit and may begin from a free plan up to yearly or even lifetime subscriptions. This is based on the services you are getting, the features you may add to your apps, and the kind of storage your app is going to need to function properly. When you have a clear budget in front of you, and a crisp list of features and services you want, it is going to be easy for you to approach the right kind of app builders. There are app building platforms that offer a great variety in the kind of templates, navigation design, and UI customizations that even a non-design person can play around with. Then there are some state of the art interfaces which would help you build some professional looking apps, but these might require certain components to be hand coded by the designer. Consider whether you need your app to be “out of the box” in terms of the graphics, or are you looking for a complete branding including the logo, color palette, icons, buttons, home screen graphics, and so on! When you are clear about this, you also understand and convey efficiently the extent of support in Graphic Design that you are going to need. Along with all the ‘must-have features” that you have listed, you would need to list out the plug-ins, the add-ons, and any integrations that you might need. Are you looking at social API integrations for Facebook, Twitter et al. Are you an e-commerce business looking for a plugin to integrate Shopify? Do you want to incorporate push notifications? Figure out what kind of integrations or add-ons, or plugins would make your app a big hit among your target users and have them ready before you go out looking for an app builder. Are you going to bring in your content from WordPress, YouTube, or your existing website? In this scenario you can go looking for an app builder that scans the existing website for content and converts the website into an app. Irrespective of whether yours is a cloud-based web service or a traditional on-site server and database setup, it is going to need back-end integration, which may even require developer support. The kind of developer support you have access to, would determine the kind of platform that would suit you best. Are you planning to integrate third-party analytics? Where are you planning to get advertising support and monetization? List out what kind of integrations you would need, whether it is features like coupons, rewards, loyalty programs, and even geo-targeted promotions using GPS, or running ads on Facebook or anything else. Now you know the advantages of using a DIY app building platform, it is time to go looking for a suitable mobile app development platform. If this is the first time you are building an app, you are going to have a tough time deciding which app builder to choose for yourself. 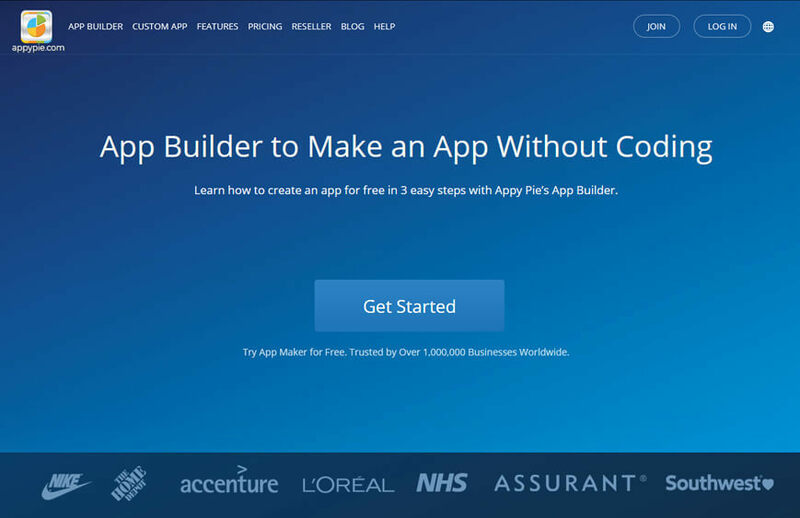 As you go looking for the right kind of app building platform, you need to know exactly what to look for, in an app builder. For a first-time app maker, this might come as quite a challenge, but Appy Pie being a veteran in the business of making apps has compiled a list of considerations that you can ponder on, while you find the best suited app builder. Every app is different and why shouldn’t it be? List out all the components that are used the most in your company. Before finalizing the app builder, figure out whether they have these components and suitable app templates for your business app. For example, if you are in the business of providing cabs, you would want an app builder that offers navigation through GPS. This is extremely important. You must know your target audience, and by now know which platform your target users are using. Hence if your app users are windows phone users, making your app for Android or iOS doesn’t make sense. 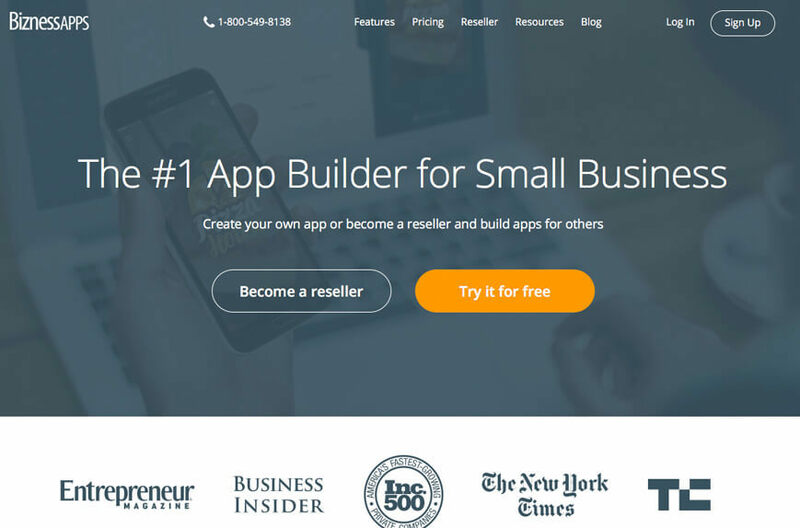 Choose an app builder that is compatible with the platform you are targeting. Ask the app builder how the updates to the content of your app would be implemented. Understand how easy or complicated the process is and choose wisely. You do not want to be stuck with an app builder that makes releasing updates a drawn-out process. Your job doesn’t end with just making an app and letting users install it on their phones. An app, like any other aspect of your business needs a set of its own commitments. Among them, the most important aspect is maintenance of the app. Choose an app builder that would take responsibility to ensure that the mobile app you built with them is compatible with most of the devices and the app stores on a continuing basis. If not today then at some point in time, there might be a need for some kind of integrations. It is important that right at the beginning, you ask the app builders whether their platforms can be integrated with other systems. You might be starting small, but you are definitely not going to stay this small forever. When you choose an app builder, ask them about the kind of scalability they are providing to the architecture of your mobile app so that it can grow organically with the growing traffic and user base. The functioning or user experience of your app must not deteriorate as the number of app users increases. Your mobile app is going to need some kind of storage built into it or integrate cloud storage. The app builder you choose should be able to offer you decent and suitable options for the app to function smoothly on any device. While most of the apps are being built either for Google Play or iOS, you might even need to publish your app on an enterprise mobile app store. In any case, make sure that the chosen app builder is capable of working with your enterprise mobile app store, otherwise you might be in trouble at the end of the whole process. This is quite a critical factor here, and it is imperative that you enquire deeply about the security options, encryption possibilities and modes of authentication that are being provided by the app builder you are choosing to work with. At this stage, you might have a fair shortlist of app builders that suit your requirements. But even now, there are some points that you would need to ponder on. When you approach the probable candidates or app building platforms, you would need to ask them the following questions. Going through the apps developed by the app builder would give you a fair idea of the kind of product you can expect from the app builder platform you are choosing to hire. You would then easily understand the level of skill the app builder is bringing to the table. If the app builder is one of the good ones, they wouldn’t hesitate from giving you a peek into the apps that they have developed in the past and offer you plenty of Apple App Store or Google Play Store links for the apps that they have built, describing in detail how these apps were brilliant in their own measure. If you sense any hesitation in showing you their past work, then it is an indication that their work might not be up to the mark. When you are choosing an app building platform, it is important that they have some experience in working with other companies of a size similar to yours. This is a factor that people tend to overlook but is of critical importance. This is simply because the way a large enterprise works is very different from the way a small business would work, which again is entirely different from the way a startup works. While it is important to look at the past work done by the organization, it is also important to familiarize yourself with the process the company is following to get to the final product. Hence, when you speak to the existing or past clients of the app builder, you get a sense of the way the company manages the relationship with their clients. When you speak with their clients ask the right questions, and more importantly listen to them. The words matter, of course, but pay attention to the tone as well. Though you might not ask them directly but remember that if the app developer is not taking time to understand the needs of your target customer, they would not be able to empathize with their needs, wants, and behaviors while developing features and designing the user experience. Gauge out how much of an importance they are going to lay on your target users and decide wisely. Since you have reached this phase of getting your own mobile app, you must have a fair amount of clarity about the features and functionality that you want in it and you must be sure that the app builder you choose can build these. You might need ratings & reviews, or an integration with the phone’s camera, or might need a third-party app integration. Does this app builder give you the confidence of being able to offer you expertise in your desired features? Features are important, but the app design and the app user experience are of great importance as well when it comes to the success of the app. When you are competing with millions of other apps, it is difficult to stand apart from competition if the app builder does not pay attention to the design and user experience of the app. A good design is more than just pretty graphics and appealing colors, it includes user interface and user experience. If the app builder you hire does not pay attention to these aspects, you would struggle with catching attention of the users. Sponsorships where you get paid by brands as you allow them to put their name on your app or app events. Each of these methods would require a different method of integration. Hence, convey to your app builders which mode are you going to leverage, and ask them whether they can implement it. Communication between you and the app builder is critical and you must be clear about the way you can interact with them. Look for a developer who is open to and aware of agile development, consistent communication, feedback collection, & iterations. No matter which phase of app development you are in, it is extremely important to communicate well and consistently. Set up a schedule for meetings, feedbacks and any other form of communication that you consider important during your app building process and talk about the support after the app has been published on the app stores. If you ignore testing your app, you are going to have an app full of flaws, bugs, and a hundred other unpleasant things. Talk to the developer about the testing process they are going to employ. As them at which stage(s) are they going to test your app. A good app builder would always give you test links to your app so that you can experience it yourself and judge whether it sits well on all the criteria you envisioned for your app. It is only when your app goes through optimum measures of testing that it should go out in the real world for the real users to peruse. Once the testing process is complete, you would then go and launch it on different app stores. This is however, quite a cumbersome task which needs time, patience, and an understanding of the whole process. The app builder might guide you through the app submission process, but make sure that your app is submitted under your name, through your app developer account. Having your own developer account and using it to publish your app gives you an ownership and access to the app for future updates or new versions of the same app. Getting the app published on the app stores is not the end of your journey. You can’t simply let your app be! Ask the app builders if they include maintenance of your app, updates, and other such issues into the subscription plans that they are offering you. They might not include this but charge you pro rata in terms of the time that it may take to make the edits, release updates or other such things. Since you are paying for the product, the ownership must lie with you. Make sure that the clear mention of ownership is drafted into the contract before you start work with them. There are other ways to do this, as well, like derivative works where a new original work is built using pre-existing elements that are copyrighted already. This way, the codes for common features can be re-used by the developers so that they can save up on time and efforts, and you can save up on money and reduce risks as well. The charges must be clearly discussed and the payment terms as well. Understand all the subscription plans they have put out in their entirety and the products and services they entail before signing on. Apart from this, it is important that you know what their payment terms are. Are they going to ask for the whole amount beforehand, or is it staggered into instalments? Are there monthly plans, yearly ones or any other innovative measures that are being implemented? Now you have answered all the queries that a mobile app builder might ask you before they begin working with you, also, you have already asked the questions that you should be asking the partnering app builders. All that remains is for you to pick the one that suits you the best. However, before you pick someone, we have put together a list of the top app builder platforms who have proven their mettle in the industry by providing excellent service in coming up with apps that are flawless in functionality and are aesthetically brilliant. 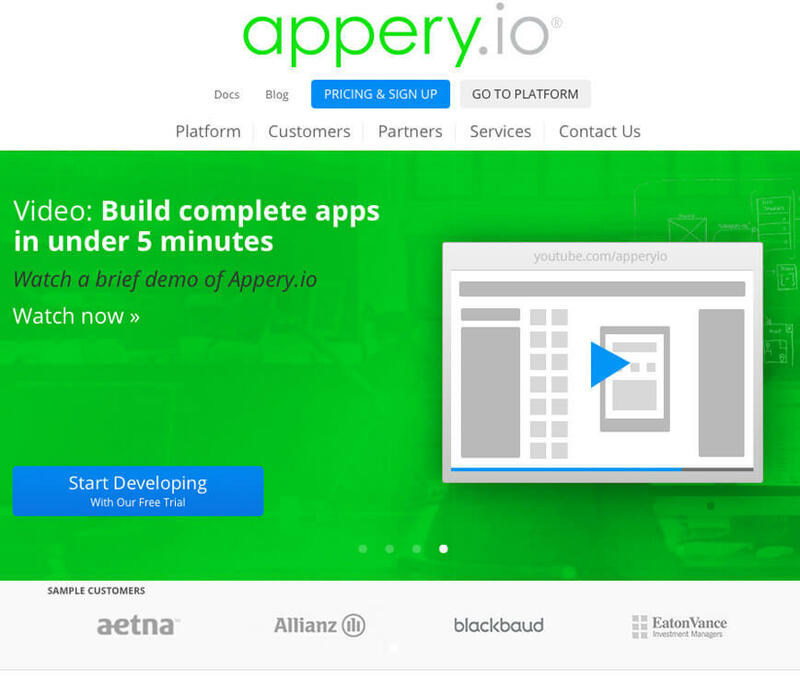 The fastest growing app building platform in the world – Appy Pie has managed to leave a deep mark on the app building industry in most parts of the world where more and more people are getting smitten by the plethora of features they offer along with the exemplary 24X7 customer service. This app building platform is especially of importance for those who are building apps for the first time and are novices in the field. The small and medium sized businesses have found the platform especially beneficial because of their wide range of plans that give them the freedom to begin building their app for free and then move to subscription plans that suit their budgets. The one reason why this platform has gained popularity so quickly is because of the unique features and the sheer number of them. Appy Pie is known for offering features that none of their competitors offer and at prices that are highly competitive. For example, with Appy Pie you can add in-app purchases, ads, upload eBooks and other intense content, connect databases, integrate social media, build instant messaging apps, and so much more! The best part is that there is a rich base of tutorials that is being developed so that customers do not get stuck with features or have any trouble in implementing any particular component in their app. Apart from this, they have quite a responsive live chat support with the option to call in for support anytime from anywhere! This is one of the easiest to use platforms that are based on a drag and drop interface enabling people with no coding skills to build their business apps with no hassle and do so in just a few minutes! The pricing plans for Appy Pie are quite affordable and are perfect for startups, entrepreneurs, and small to medium sized businesses. Shoutem is one of the most polished products in the market and has only been growing since they were first founded in the year 2011. In their latest V5, they have made quite a few and have updated their platform enhancing the user experience manifold. They have quite sleek template designs with a great number of options to customize them so that each app has unique aesthetics and design. Not only would your apps made here be good looking but also, they would have some great features. 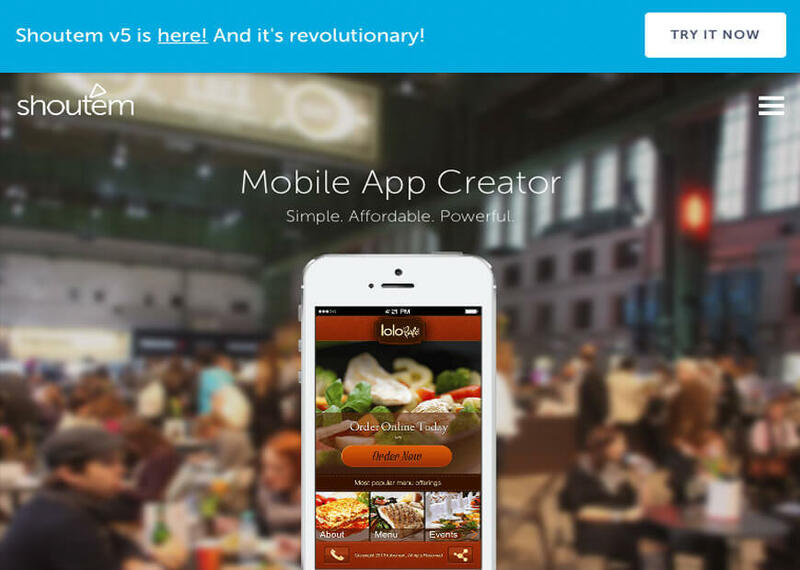 This app building platform is especially great for Event apps. The app is especially great for communities as well because of their Social Wall, where the users can share comments and photos. However, the subscription plans are not so pocket friendly. With plans beginning from$49, they might not be the most expensive of the lot, but it is not cheap either. The cheapest of their plan that would allow you to publish your app on Apple App Store begins at $79.00 which is quite a pocket burner, particularly for the small and medium sized businesses or the startups. Shoutem are making their codes open and available to developers in their bid to get more and more people to build additional extensions or develop more features for them, as this is one area where they do not feature high in the ranks. In all, the designs, user experience, and templates might be exemplary, Shoutem is still low on the number of features it offers as an app building platform. 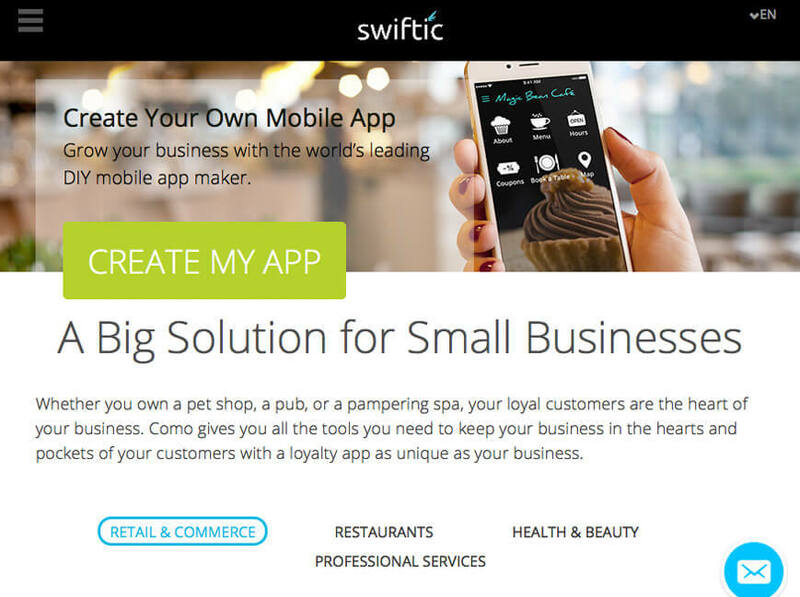 Founded in the year 2010, Swiftic began as Como in Israel and has since been responsible for powering more than a million apps all over the world, which probably makes it one of the biggest fishes in the app builders’ pond today. The components or building blocks that are provided by this app building platform are varied and include loyalty card feature, integrations for scheduling appointments, ecommerce, reviews & ratings from users, and events. The majority of apps that are built on their app building platform include businesses like restaurants, bands, and other kinds of organizations that run events. In one of their recent moves, Swiftic has restructured their pricing completely. They have now shifted their structure to have just but one tier that has either a monthly ($57) subscription, yearly ($48) option, or bi-yearly ($41) payment plan. As a gesture of good faith and a show of their confidence, some of their updates go on to promise a 6-month success guarantee, which means that if you were unable to achieve “any meaningful business result” with your app, Swiftic would give you six months of service for free. Everything about this app builder starting right from its name is interesting. 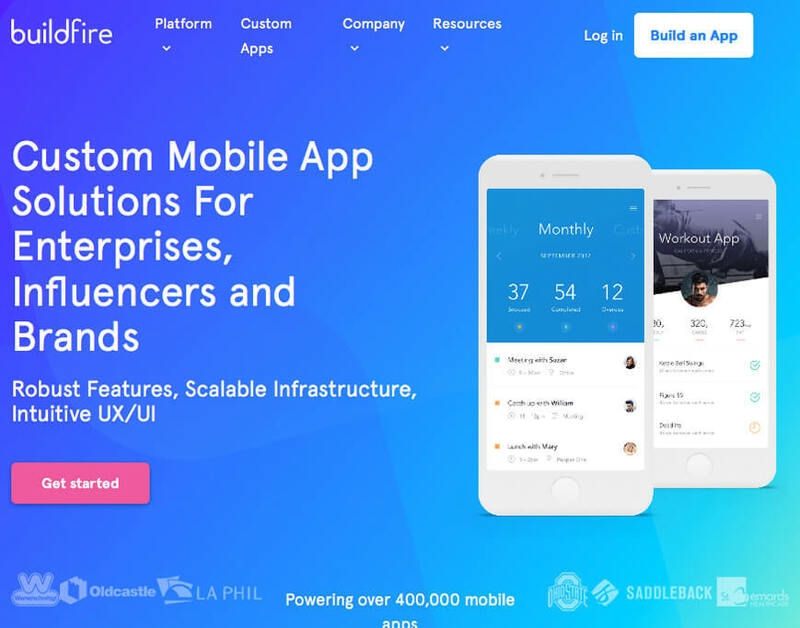 Based out of the French island of Corsica, the app building platform has some of the most impressive themes. Apart from the looks department, the app building platform is also known for offering some of the most advanced features including social networking, chat, Geofencing, iBeacons, and more. 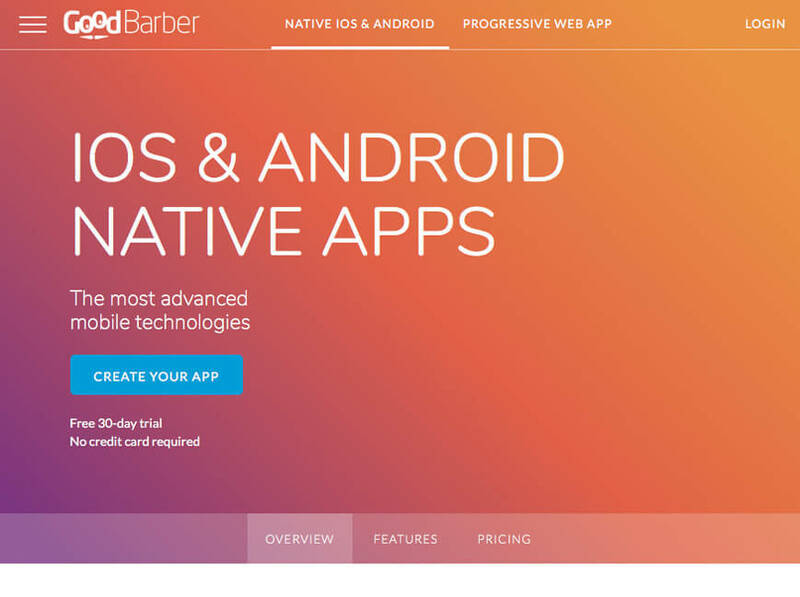 With GoodBarber, you can get a native Android app for a monthly subscription plan of $32, and if you are looking for both Android & iOS, the monthly subscription plan would run up to $96. Both plans however include quite an impressive progressive web app. The app building platform proudly showcases the apps that have been created with their platform, so that you know the quality and the range of apps they are capable of offering, to you and the other clients. Not only are their templates beautiful, but they also offer quite a competitive pricing for native apps. They offer some great add on features like push notifications, chat etc. while offering great flexibility while building their apps. One shortcoming, however is a lack of an online store of their own, but you can always integrate third party stores like Amazon, Etsy, Shopify etc. 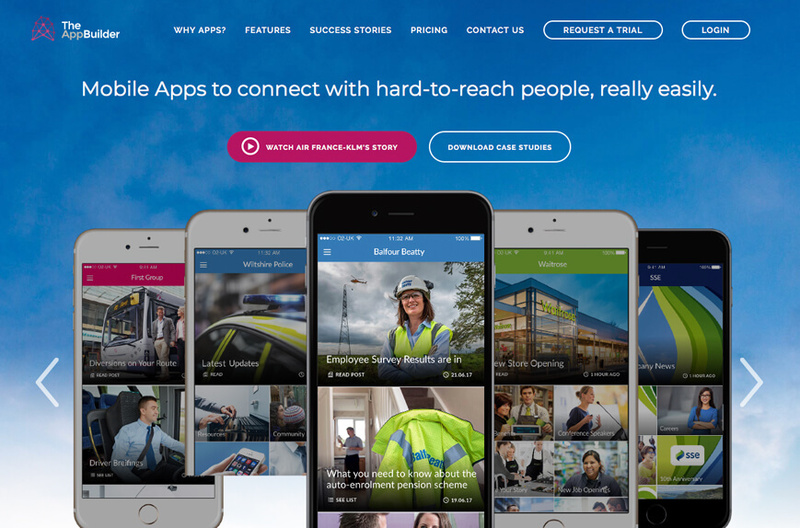 Having built apps for and supporting 30,000 businesses through their app building platform, BuildFire is one of the more reliable platforms. Most of their clientele fall in the category of enterprises, influencers, and brands. BuildFire showcases themselves as a platform that is one of the leading platforms in the industry that offer accelerated app development. The combined power of a user-friendly dashboard and admin control panel eases out the whole process of releasing updates. The platform is particularly popular among the clients due to the ease of use, prompt configurability, and the vast extent & possibilities of customization of the app. It is possible to make changes to the app on the fly and even test these changes out in real time. They offer a free plan and a Premium Plan that is available for $49 a month. This app building platform is one of those that have established themselves as app builders for everyone! 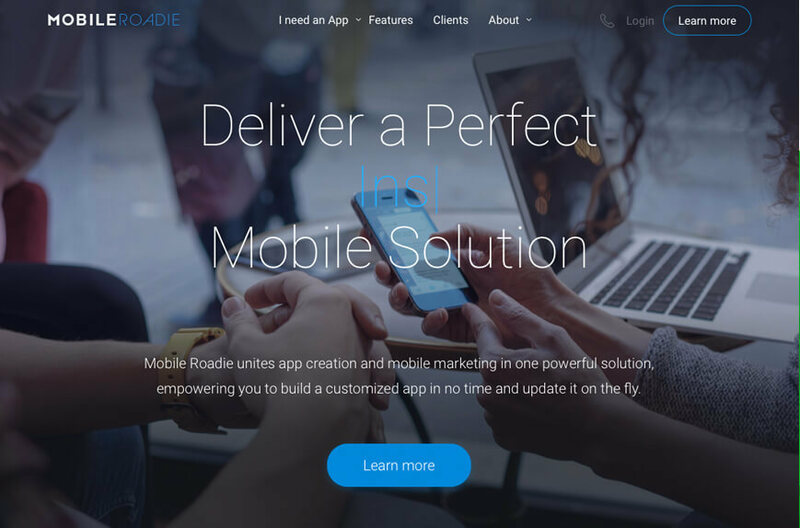 Their motto is that everyone should be able to build their own app and be able to make a whole lot of money with Admob platform. However, it is important that you understand, in order to make any money first, you would have to make some investments. With Mobincube however, you do not have to burn a hole in your pocket, because it is surprisingly affordable. The lowest of the ad-free plans with Mobincube begin at $9.99. It might come as a surprise to most people but this platform lets you Go Native with each one of their plans from the lowest to the highest, which means that you can upload the app that you build on a single one or all of the popular app stores. Though the editor might seem to be a little primitive at times and you might have to keep switching browsers in order to be able to use specific features. However, all that they do offer does seem to be quite a power packed platform where you can even create some pretty complex page types, like using SQLite based database to pull in data from an external server. While there might be a huge scope of improvement in the department of user friendliness, there is no other app building platform that offers you a real app for free. The platform has very competitive prices and a huge variety of templates to choose from with highly innovative features to choose from. There however, is still a need to smooth out the technical hiccups that the platform faces, and the templates are a little too restrictive as well. Currently the biggest app makers in the UK, AppInstitute has won several prestigious startup awards. The platform is specially great when it comes to ecommerce features, like catalogue menus that are extremely customizable and loyalty options that are quite lucrative. The great thing here is that you can make payments from within the app, without navigating out of it for any reason whatsoever. This is a great measure for those concerned about security & privacy. Their booking feature in particular is unique as it extends the ability of simply making appointments or bookings to creating some really rich events that can be supplemented with interesting content including videos. The apps you build here can be availed for a monthly subscription of $49 a month (Android & PWA) or $81 a month (iOS). This subscription comes with the features like basic push notifications & app analytics. The features available on the platform are actually a lot stronger than what they might appear to be at the first glance. However, you might observe a quite clear need for better options for integration on the backend. The app building platform has in fact named it quite suitably. AppMachine is unique in having automated as many of the tedious processes as possible. if you already have a website, they can simply pull out all the relevant information with just your URL. This can even include your Facebook, Twitter and other social media feed, RSS feed, and even your images. The editor AppMachine is not just impressive visually but is fairly easily navigable without overwhelming you in any manner. Though not every component right from the beginning may be intuitive, but they sure seem promising in their climb up to the top. At the moment, they are offering two different plans with Plus at $49 a month and Pro at $69 a month. While they might have managed to offer quite a powerful editor with a fairly comprehensive building block selection, but there is a need for the user interface to be more logical and quicker. iBuildApp has one of the easiest to use drag and drop editor, a built-in Content Management System and more than a thousand app templates to choose from! This app building platform has emerged as one of the ultimate all-rounders when it comes to building exemplary apps that are beautifully designed and need absolutely no programming knowledge. The featured templates on the app building platform might not look ground-breaking, but the platform has been used for more than a million times, and that must say something about it. Starting from a basic plan starting at $9.99 a month, there is a business plan for $39 a month, and an enterprise or agency plan for $99 a month. You can even go for a free trial before you opt for a more serious investment in it. Now this is an impressive platform! The Singapore based app building platform has almost 2 million apps built on it. Not only do they claim to build an app in a mere 20 minutes, but they do so in quite a cost effective manner. They have a free plan which can be converted to a $2 monthly plan for PWA, and a yearly plan for $99 for iOS & Android. 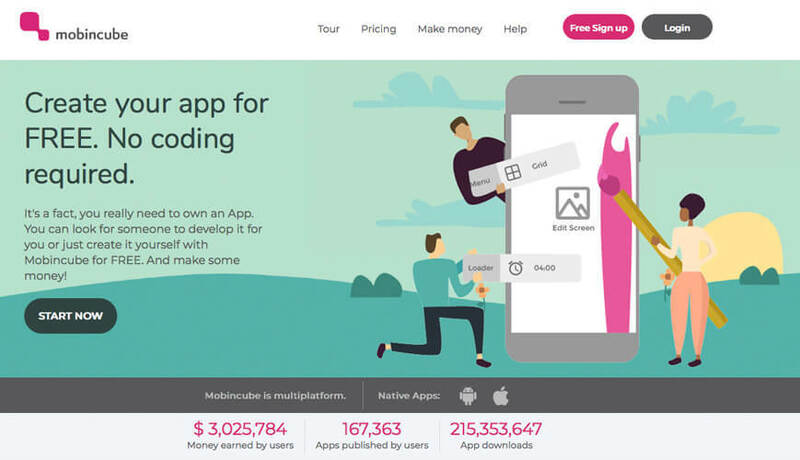 On the whole the app building platform is in fact quite an affordable one. They offer a great number of building blocks and offer the option to tweak the design of the app, but visually, the editor of the app builder leaves you quite underwhelmed. It might have some great app features and building blocks but is definitely in need for a major design overhaul. This is one of the cloud based app builders which can be used to build apps for all the leading app stores including Android, iOS, and Windows Phone while including Phone Gap providing access to its built in components. As this is a cloud based app building platform, there is no need to download and/or install anything, which makes it convenient to begin the process of building your app quite quickly. This platform too has a drag and drop interface to build the UI of the app and lets you connect to any of the REST API and then use them in your app. What’s more, the app data can be stored by instantly adding a cloud database and backend to your app whenever needed. The apps made here also make collaboration simple, so that you can share your project can be shared with the developers, business users and your customers in real time. The plans vary greatly as they begin from free and can go up to $180 a month! They are one of the bigger players in the mobile app building platform with clients like Disney, TED.org, Universal and more of a similar standing. Their pricing plans start from a CORE plan at $149 a month to their PRO plan that is marked at a hefty $799 a month. This is quite clearly indicative of the clients that they are targeting. The design options for their templates are many, but there is also an added bonus of you being able to tweak them to your liking. The app builder offers some great community app features like chat and a fan wall which makes it especially interesting for artists and bands. The music player which can be smoothly integrated here is popular particularly among the musicians. Apart from this, the app builder can boast of come pretty advanced app features like geo-targeting the content. However, due to the wide range of features that it offers, the apps built on this platform take a lot longer to build. Also, the user interface of the platform needs to be a little more intuitive. TheAppBuilder offers two different approaches and has whole suite of apps that would suit employees, clients, events, and brochures. The app can be build easily with the online toolkit and you would get help either from the training or from TheAppBuilder itself so that you can define and build the structure of the app, so that you can populate it with some content to begin with. You can make use of the dedicated AppLibrary and offer to your users a peek into multiple apps and you can even customize it with your own branding. What’s more, you can make changes to the structure and content of your app, even after it has gone live. You can build native apps for iPhone, iPad, & Android and on the platform any updates you make go live within 60 seconds of making the change. 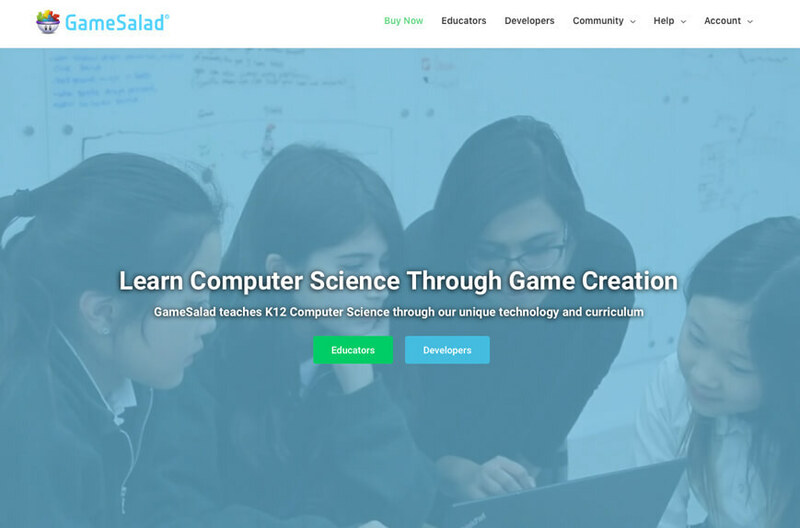 GameSalad is a fabulous platform that lets you build and publish games for a number of platforms including iOS, Android, HTML5, and OS X. Its drag and drop interface lets you build a game without ay coding skills or programming knowledge. The game creator has a scene and actor editor, which is where all the action would happen. This is where you would be setting up the actors in a scene and creating attributes, images, sounds etc. The app building platform also has quite an active community forum which offers access to help and advice from other independent game designers. The pricing plans for GameSalad start from free and go up to $299 a year. 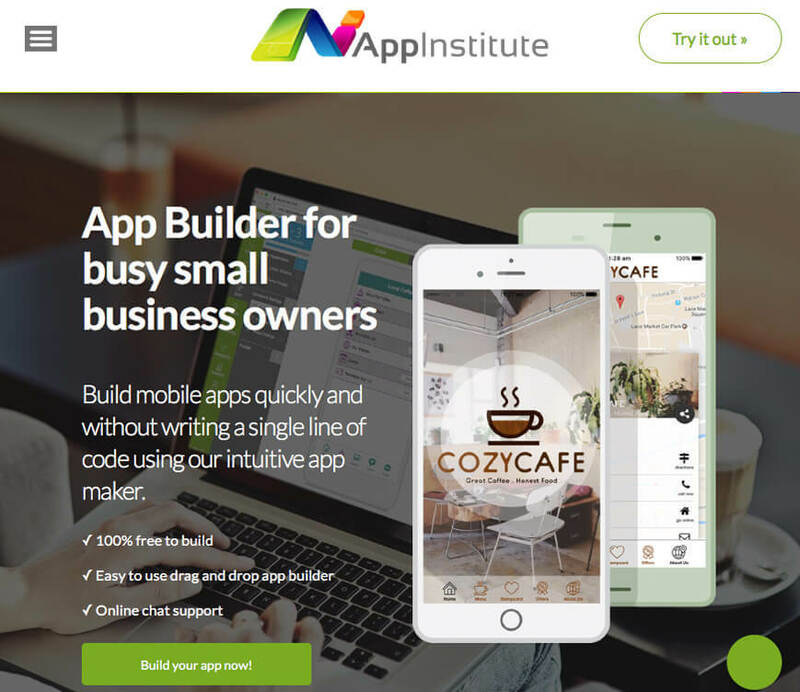 BiznessApps is a great app building platform that can help you create mobile apps for business using a really simple process. It has plenty of features including food ordering, ecommerce, loyalty program, third party app integrations, push notifications, app analytics, and more. You can create an app for yourself within minutes using their user-friendly content management system, where you can customize everything using your own designs for all kinds of elements. What’s interesting is that you can check real time previews of your app even as you are designing and developing it. With BiznessApps you can easily update your app online and make as many changes as you like without having to follow the long drawn out process of an update on Google Play or iTunes. Apart from all this, the platform is rich with tutorials and training materials. The subscription plans here begin at $29 a month for PWAs and go up to $99 a month for mobile apps. Choose wisely, choose well. Find an app builder that is good for you because what works for your friend or colleague might not work that well for you. It is important that you give this part of the process some time before going on to select an app building platform for your mobile app for business.